Tuesdays are Made for Music! After our music class, we reviewed our emergency drills.. We’re doing it pretty well, hey? Today is Totally Terrific Tuesday! Time for another music class with John– John! When we came to the room, we had the tissue paper we used for our “rainbow shower” on the table. Kiki showed us that we can roll it up into tiny balls, then we can glue it on some flower cutouts. It all looked so pretty! Then, at the middle of the flower, we stuck our picture on it. The cars, as usual, was a big hit on the carpet, which we played with Sayaka. When Pauline called out, “Who wants to play ‘Chutes and Ladders’?”, some of our friends excitedly came with her to the big table. It sounded like an interesting game. So we spin the arrow, and whichever number it points to, that’s the number of squares we have to move on the board. If we land on a square with a ladder, we can go up; but if we land on a square with a chute, then we slide down. We had our early snacks, then John came to our classroom. We practiced singing our classroom rules song– we just love dancing to it. We also practiced singing our “Do– Re– Mi”, like last week. It’s like stretching our vocal chords to reach the highest ‘do”! We also did rhythm practice where “ta” means we should clap, “ti-ti” we should stomp, “Ssh” means we should be quiet, and “to” means we should turn around. Boy, it turned into a dance workout– it was fun! After that, we changed the things in our calendar with the help of our X and Y, our Calendar Consultants. X changed the day to Tuesday, and Y changed the date to 18. Our Weather Watcher Z reported to us that it’s “Sunny and cloudy”, and V said it means it’s “Partly cloudy”. We also changed the season to autumn, as the season is slowly transitioning, and there are times that the temperature is cooler. Pauline asked what is autumn, and W answered, “The leaves fall.” She’s right, plus from a green color, they turn into orange, red, or brown. We reviewed on what we did yesterday, which was the evacuation drill. “What’s our safe zone?” Our teachers asked. “What do we cover when there’s a fire?” Pauline asked. We covered our nose and mouth in answer. “If there’s an earthquake?” Pauline asked. We covered our heads in response. “Dango mushi!” X said, and everyone assumed the position of dango mushi. 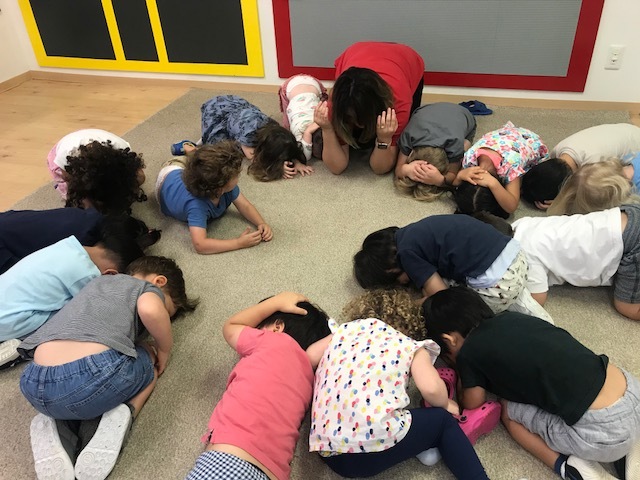 Our teachers checked if we were doing it right– we should be kneeling on the floor, curled into a ball, with our foreheads touching the floor. Our arms should be covering the back of our heads, not our faces. Sayaka took the cushion and pretended it was falling on us– and we did a good job of protecting our heads. Sayaka and Kiki also played the earthquake and fire alarm, so that if we heard it, then we know what to do. We also talked about if there’s an emergency, our belongings like backpacks, shoes, and toys become unimportant, so we don’t need to go back inside the building if we have already evacuated outside. After that, we decided that we wanted to remain indoors instead of going to the park, and the majority voted on playing with the marbles and wooden blocks. After playing, we had our lunch. What a Tuesday, eh? How was yours? All the ever– ready children in Petals Class.